BSN, University of New Hampshire, Durham, N.H.
MSN, Northeastern University, Boston, Mass. PhD, Sinclair School of Nursing, University of Missouri, Columbia, Mo. 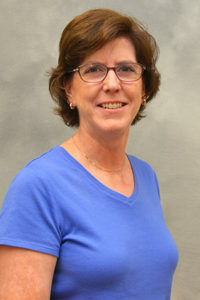 Dr. Laurel Despins is currently an assistant professor at the University of Missouri Sinclair School of Nursing. She has been an RN since 1982 and has worked in acute care telemetry units and adult intensive care units. Dr. Despins worked as a clinical nurse specialist in medical intensive care units (ICU) and a performance improvement professional for medical ICU and general medicine service lines. Wakefield, D.S., Wakefield, B.J., Despins, L., Brandt, J., Davis, W., Clements, K., & Steinmann,W. (2012). A systematic review of verbal order policies in acute care hospitals. Journal on Quality and Patient Safety, 38(1), 24 – 33. Bragg, J.D., Cox, K.R., Despins, L., Hall, L.W., & Bechtold, M.L. (2010) Improvements in carein acute pancreatitis by the adoption of an acute pancreatitis algorithm. JOP, Journal of the Pancreas, 11(2), 183 – 185. Despins, L.A., Scott-Cawiezell, J., & Rouder, J.N. (2010) Detection of patient risk by nurses: A theoretical framework.Journal of Advanced Nursing, 66(2), 465 – 474. Despins, L.A. (2007) Patient safety and collaboration of the intensive care unit team. Critical Care Nurse, 29(2), 85 – 91. Banks-Wallace, J., Despins, L., Adams-Leander, S., McBroom, S., & Tandy, L. (2007) Introductory nursing theory courses as contexts for shaping emerging scholars conceptualizations about the scope and function of our discipline.Advances in Nursing Science, 31, 67-78. Despins, L.A., Kivlahan, C., Cox, K. (2005) Acute pancreatitis: diagnosis and treatment of a potentially fatal condition.American Journal of Nursing, 105, 54-58. Despins, L., Ahrens, M., Miller, R., Reid, L., Sangha, H., Heimsoth, S., Vollrath, C. (2014). “Implementing Therapeutic Hypothermia for Post-Cardiac Arrest Medical Patients”, University of Missouri Health System, 2014 UMHS Innovation and Improvement Sharing Days, Columbia, Mo. April 29 – May 1, 2014. Despins, L., Burks, M., Heimsoth, S., Lowes, J., Lyle, A., Marshall, K., Murphy, A., Williamson, P. (2014). “Improving Consistency of Nursing Documentation of Daily Sedation Interruption in Mechanically Ventilated Patients with Sedation Infusions”, University of Missouri Health System, 2014 UMHS Innovation and Improvement Sharing Days, Columbia, Mo. April 29 – May 1, 2014. Cox, K., Hahn-Cover, K., Cooper, K., Butler, K., Massey, J.L., Despins, L.A. (2014). “Deploying a Flexible Culture Through Crew Resources Management (CRM) Tools/Techniques”, University of Missouri Health System, 2014 UMHS Innovation and Improvement Sharing Days, Columbia, Mo. April 29 – May 1, 2014. Geiger, D., Zorsch, S., Moore, G., Schmidt, J.N., Collins, B.V., Despins, L.A., Massey, J.L. (2014). “Sleep Study Result Reporting”, University of Missouri Health System, 2014 UMHS Innovation and Improvement Sharing Days, Columbia, Mo. April 29 – May 1, 2014. Fegley, R., Schlotzhauer, C., Despins, L. (2014). “Use of Chlorhexidine Gluconate While Bathing to Reduce the Incidence of Central Line-Associated Blood Stream Infections”, 7th Annual Evidence-Based Practice on the Frontline, Building a Culture of Quality, Safety, and Nursing Professionalism, Columbia, Mo. April 17, 2014. Despins, L., Guilford, S., Hebbar, S., Matthews, K., Nichols, M., See, W., Tharakan, A. (2013). “Peri-Operative Glycemic Control”, University of Missouri Health System, 2013 MUHS Innovation and Improvement Sharing Days, Columbia, Mo. May 2-3, 2013. Despins, L.A. (2012). “Factors influencing patient risk detection in intensive care unit nurses”, MNRS 36th Annual Research Conference; Dearborn, Mi. April 12-15, 2012. Despins, L.A. (2011). “Factors influencing patient risk detection in intensive care unit nurses”, University of Missouri, School of Medicine “Health Sciences Research Day”, Columbia, Mo. November 3, 2011. Despins, L.A. (2010). “Effect of a primed goal of patient safety on patient risk detection”, University of Missouri, School of Medicine “Health Sciences Research Day”, Columbia, Mo. November 11, 2010. Hall, L., Cox, K.R., Scott, S., Aud, M., Allmon, A., Despins, L., Pasupathy, K. (2007). “Interprofessional teamwork in health care – A successful model that creates ‘open spaces for learning’ about quality and safety”, International Symposium on Improving the Quality and Value of Health Care; Orlando, FL; December, 2007. Cox, K.R., Hall, L.W., Despins, L., Scott, S., Liu, P. (2007). “The effects of crew resource management training on patient safety culture transformation”, 13th International Symposium on Improving the Quality and Value of Health Care; Orlando, FL; December, 2007. Despins, L., Brietzke, S. (2007). “Addressing Hypoglycemic Risk Factors in Insulin Administration”, Center for Patient Safety, Patient Safety: Achieving Success in Missouri, Columbia, MO. March 28-29, 2007. Despins, L., Brietzke, S., Razavi, S. (2006). “Mitigating Unintended Harm While Implementing an Intravenous Insulin Infusion Protocol”, Sinclair School of Nursing Research Day, Columbia, MO. April 20, 2006. Despins, L., Nelson, K., Cox, K., Hill, J. (2005). “The Effect of Daily Pre-briefing Sessions onTeam Building in an Intensive Care Unit”, American Association of Critical Care Nurses’ National Teaching Institute, New Orleans, LA., May 2005. Despins, L., Feutz, C., Felten, S., Brietzke, S., Lancey, R., Moore, R., et al. (2005). “Implementing An Insulin Infusion Protocol from a Paradigm of Patient Safety”, Twelfth National Conference on Evidence-Based Practice, Coralville, IA, April 23, 2005. Nelson, K.J., Hall, L.W., Unger, C., Cox, K.R., Despins, L.A., Tinsley, A., Hill, J., Clark, R., & Nixon, W. (2004). “Crew Resource Management Training as a Means to Improve Patient Safety”, Institute for Healthcare Improvement National Quality Forum, Scientific Symposium, Orlando, FL., December 13, 2004. Despins, L., Kaplan, C.A., Cox, K. (2003). “Development and implementation of an ICU agitation and sedation protocol”, Tenth National Conference on Evidence Based Practice, Coralville, IA, April 23, 2003. Groves, P., Despins, L., Scott-Cawiezell. (2012) Quality Improvement and Safety Competencies in Graduate Distance Education, Innovation to Transformation, 2012 QSEN National Forum, Phoenix, Az., May 31, 2012. Hall, L., Despins, L. (2007) Use of Simulated Root Cause Analysis to Teach Patient Safety Skills to Interprofessional Health Care Learners, Collaborating Across Borders: An American Canadian Dialogue on Interprofessional Health Education Conference, Minneapolis, Minn., October 26, 2007. Despins, L. (2007) Hand-Offs and Team Training, Quality and Safety: Strength in Partnerships Conference, Coralville, IA, September 19, 2007. DeGraaf, R., Despins, L., Pasupathy, K., Savage, G. (2007) Interprofessional Curriculum inTeamwork, Patient Safety, and Quality. Using New and Effective Teaching Methodologies for Educating Healthcare Managers, Association of University Programs in Health Administration, 2007 Annual Meeting, Orlando, FL, June 1, 2007. Kaplan, C., Despins, L. (2006) Communication in the Critical Care Unit: An InterdisciplinaryTeam Approach. Respiratory Care Network Meeting. CHEST 2006, American College of Chest Physicians, Salt Lake City, Utah, October 24, 2006. Kaplan, C., Despins, L. (2005) Communication in the Critical Care Unit: An Interdisciplinary Team Approach. Respiratory Care Network Meeting. CHEST 2005, American College of Chest Physicians, Montreal, Canada, November 2, 2005. Despins, L., Hill, J. (2004) Optimizing Healthcare Using Aviation Best Practices. Governor’s Commission on Patient Safety, Jefferson City, MO., January 2004. Despins, L. (2003) Implementation strategies for the Acute Pancreatitis algorithm. Missouri Health Care Best Practices Conference, St. Louis, MO., May 16, 2003. Despins, L., (2003). Implementation strategies for the Acute Pancreatitis algorithm. Tenth National Conference on Evidence-Based Practice, Coralville, IA, April 23, 2003.